From the men’s 200m heats through to the women’s 1500m final, here’s a detailed guide to the action on day four of the IAAF World Championships in London. Want to know what else is coming up? Check out our day-by-day guide here and see the latest edition of AW magazine for full event-by-event previews. The first three and the next three on time progress to the semi-finals. Former 100m winner, Yohan Blake, who was fourth in the 100m here, heads entries in heat one. On form this year, Colombian Bernando Baloyes and Japan’s Abdul Hakim Sani Brown may join him. Trinidad’s Jereem Richard is quickest this year in heat two with a 19.97 but Jamaica’s Commonwealth champion Rasheed Dwyer has the faster PB of 19.80. American Kyree King may have a hard fight for a top three spot. The favourite Wayde Van Niekerk warms up for Tuesday’s 400m final by running in heat three where the opposition includes Britain’s Danny Talbot, who should qualify comfortably. The 2009 world medallist Alonso Edward doesn’t look in his best form and Jan Volko, who ran well in the 100m, looks favourite for third spot. The fourth heat should go the way of the US champion Ameer Webb though Turkey’s Ramil Guliyev has been in scintillating form this year. The double Olympic bronze medallist Christophe Lemaitre, who has been disappointing this year, may have to fight for the third spot. Isaac Makwala should win heat five, but is another with the 400m final in mind and 2013 world silver medallist Warren Weir should challenge. Trinidad’s Kyle Greaux may get third. GB’s 2015 fifth-placer Zharnel Hughes goes in heat six against former US champion Isiah Young and South African London 100m fifth-placer Akani Simbine. The seventh and final heat should be won by Nethaneel Mitchell-Blake with South African Clarence Munyai and Canadian Aaron Brown looking his most likely dangers. It requires a tough 17.00m to make the final though a more likely top-12 place will get jumpers through. Britain’s Nathan Fox has a near impossible task being world ranked 45th this year. More likely finalists are Olympic champion Christian Taylor and Rio silver medallist Will Claye. Defending champion and world record-holder Anita Wlodarczyk should win easily. It’s not impossible that Poland could clean sweep as Malwina Kopron and Joanna Fiodorow have thrown 75m this year. China’s Asian record-holder Zheng Whang, who failed out in the Rio final, should challenge along with Beijing runner-up Zhang Wunxia and Hanna Syydan. Sophie Hitchon is only ranked eighth of the 12 throwers on 2017 distances but the Rio bronze medallist is a superb competitor and should challenge. The first four in each heat go through along with the four fastest losers. American champion and world-leader Dalilah Muhammad should dominate heat one with Sage Watson and Leah Nugent looking the best of the rest. Heat two should be won by defending champion Zuzana Hejnova though Rio runner-up Sara Slott Petersen is also in the line up along with American Cassandra Tate. Britain’s Jessica Turner will probably need a PB to progress. American Shamier Little starts favourite in heat three with Olympic finalist Ristananna Tracey a likely second. Kori Carter is much the fastest in heat four and Britain’s team captain Eilidh Doyle should have no problem joining her. Heat five should be between Lea Sprunger and Rhonda White who both have 54.29 PBs from this year. Meghan Besley is the slowest of the eight on paper but improving race by race this season. The first two advance along with the next two fastest to the final. Heat one has Olympic champion Kerron Clement up against European star Karsten Warholm but Ireland’s Rio fourth-placer Thomas Barr has been forced to withdraw through illness. The second heat looks well matched and has Jack Green up against American TJ Holmes and Jamaican Jaheel Hyde and France’s Mamadou Hann. The final heat has Olympic bronze medallist Yasmani Copello and American Eric Futch and Qatar’s Abderrahaman Samba as the favourites. This should be between defending champion Caterine Ibarguen, who may be just past her best, and improving world leader and Rio runner-up Yulimar Rojas . The 2012 champion from London, Olga Rypakova, can’t be discounted after heading qualifying. The first two in each heat make the final along with the next two fastest. Olympic champion Shaunae Miller-Uibo goes in heat one with US champion Quanara Hayes the obvious choice for second though Stephenie McPherson has previously made four global finals. The second semi-final will be dominated by defending champion Allyson Felix though the fastest from the heats, Salwa Eid Naser and 2007 runner-up Novlene Williams-Mills, who has made every final since and Beijing and Rio bronze medallist Shericka Jackson make this the toughest heat. American Phyllis Francis and Jamaica’s Chrisann Gordon should go through untroubled in heat three. Zoey Clark is the slowest on times and will be out at least improve her 51.84 PB. The draw is defending champion Sergey Shubenkov, Rio runner-up Orlando Ortega, Olympic champion Omer McLeod, Hungary’s Balaza Baji, France’s Garfield Darien, Barbados’ Shane Brathwaite, 2012 bronze medllist Hansle Parchment and world record-holder Aries Merritt. After a poor first few days, Jamaica should win their first gold through McLeod with London 2012 champion Aries Merritt his most likely challenger as he aims to make a dream comeback after his kidney transplant. The atmosphere will be electric as Laura Muir challenges for a medal. However, it will be in one of the best quality races of the Championships and on 2017 form she is down on world indoor champion and world-leader Sifan Hassan, Olympic champion Faith Kipyegon and wold-record holder and defending champion Genzebe Dibaba. The latter only qualified as a fastest loser to the final though. In a slow run race, Olympic 800m champion Caster Semenya could beat them all despite her inexperience at 1500m. Former champion Jenny Simpson and Poland’s European champion Angela Cichocka are also dangerous in a slow run race. 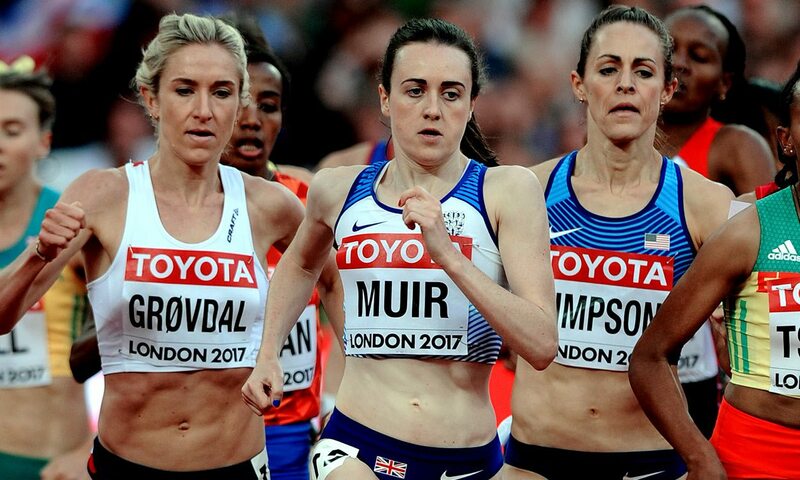 Both Muir and double Olympic finalist Laura Weightman will clearly benefit from a fast but not suicidal pace or bursts, after the dawdles of past championships preceded wild early sprints, and will hope the home support will raise their game.